Russian President Vladimir Putin meets with British Prime Minister Theresa May as part of the G20 Summit in China on Sept. 4. British firms can reap rich benefits from bold and resolute moves to capitalize on Russia's vast market. Theresa May’s call at the G20 summit for “frank and open dialogue” with Russia comes in the wake of her telephone conversation in August with President Vladimir Putin, when both leaders underlined their shared interest in fighting terrorism. In the context of post-Brexit uncertainty, it would be unwise to ignore another interest the two nations share – that of developing business ties. 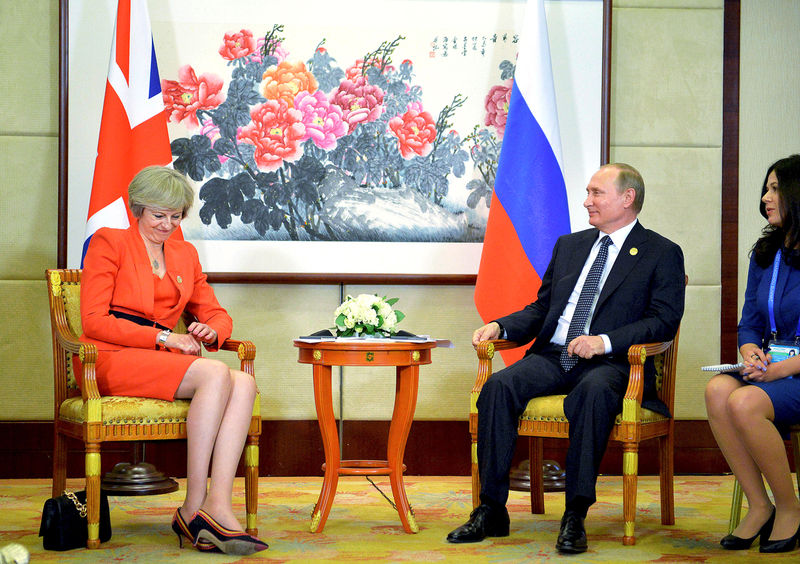 The recent G20 summit marked the first face-to-face meeting between the British prime minister Theresa May and Russian president Vladimir Putin. The tone of the discussions was broadly positive. While May acknowledged the “complex and serious areas of concern and issues to discuss,” she also emphasized the need for “frank and open dialogue” between the two governments. A change in tack, perhaps, for May, who had previously indicated that she would continue the policy of her predecessor on Russia. The meeting was not the first time the leaders had been in contact, though. The British PM surprised Downing Street watchers and Kremlinologists alike by making a direct phone call to her Russian counterpart on Aug. 9. May’s choice of topic - that of countering aviation terrorism - was a diplomatic one. Finding common ground is the very basis of diplomacy, and the subject of passenger safety leaves little scope for disagreement. May’s muted but pragmatic overtures to Moscow show that even if governments are divided by political concerns, they continue to face common threats and to share common interests. And now that Britain’s future relations with the EU are uncertain, the time is right to search for as many potential political and business partners as possible, to find a basis for economic cooperation where politics divides. The case for doing business with Russia is not always an easy one to make. Political preoccupations have been at the front of many potential exporters’ minds in recent years. Yet there is strong demand for UK-produced goods and services in Russia, and if British companies play their cards right, the profits can be significant, according to Trevor Barton, head of the Russo-British Chamber of Commerce. Barton and Cant are also keen to stress that sanctions have a limited impact on trade with Russia, since they only apply to a small number of goods, services and individuals. “Unless you are doing business with a Russian company owned by someone on the sanctions ‘wanted’ list, or you are selling military or dual-use technology, then most companies will find themselves able to do business,” Cant said. Certain sectors appear to hold particularly high potential for British companies. Hi-tech British-manufactured products for use in the Russian natural resources sector – measuring equipment or pipeline technology, for example – are strongly in demand. “There is a substantial amount of onshore exploration and extraction, which can compensate for potential losses that may be experienced by British exporters in sanctioned offshore oil production,” Barton said. Anything to do with Russian railways also provides opportunities for British exporters. Several huge modernization projects are currently under way; 2016 alone will see the renovation of 3,700 miles of track involving all types of repair, according to the official network website. The 2018 World Cup in Russia also offers potentially rich pickings. Three of the European regional sponsorship slots are still up for grabs, and the event requires massive hotel and transport infrastructure redevelopment in the 12 host cities. Ticketing systems and crowd control models are also areas where British expertise would be welcomed. What does new UK leader Theresa May mean for Moscow? “Britain has a fantastic reputation for organizing large-scale events, as the London Olympics showed. Russians in particular think that the British are great at this. Now is the time to push for British businesses to get involved,” said Barton. The British luxury goods market remains strong. Brands such as Range Rover and Bentley have a real cachet in Russia, according to Barton, as do the names of British boarding schools and universities. “A house in the Chilterns and an Oxbridge education for their children are aspirations for many wealthy Russians – and a lot of other Russians have significant disposable income, despite the fall in the value of the ruble, since most don’t have mortgages or significant expenditure on insurance. Russians want the best, and they are still prepared to pay for it,” Barton added. Accepting sanctions as a minimal constraint, and embracing Brexit as an opportunity for expanded horizons, it is time for British companies to look beyond the mythical “new Iron Curtain’’ to the wealth of opportunities that lies beyond.